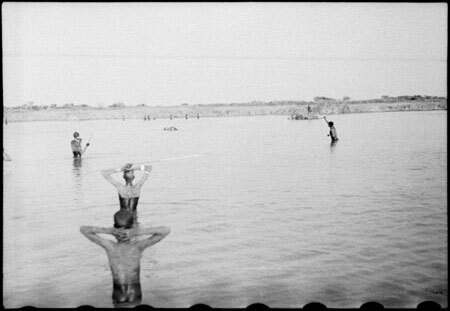 Looking across a lagoon towards a number of Nuer wading and punting on floating beds of vegetation as part of a hippo hunt. Their hippo quarry can be seen in the centre of the river. Thesiger wrote that the Nuer prized hippopotamus meat for its fat content, and he occasionally shot a hippo to provide his porters with a treat. Morton, Chris. "Nuer men hunting hippo" Southern Sudan Project (in development). 03 Jan. 2006. Pitt Rivers Museum. <http://southernsudan.prm.ox.ac.uk/details/2004.130.32854.1/>.